Halloween dates back to the Celtic farming festival Samhain. (NEW YORK) — Halloween dates back to the Celtic farming festival Samhain. The holiday marked the end of the harvest season and the beginning of winter. As the crops died, farmers believed there was a day when spirits could rise from their graves. During Samhain, Celtic people would dress in disguise to fool and ward off the spirits, hoping to protect their land through the upcoming winter. In the eighth century, Christians sought to transform the pagan holiday. Pope Gregory III declared Nov. 1 to be the feast of All Saints’ Day. The night before became known as All Hollow’s Eve. During the medieval period, children and poor people would practice “souling,” where they went door-to-door asking for donations or food in exchange for prayers honoring the person who answered the door. Modern Halloween traditions and folklore first came to America in the 19th century with the influx of Irish immigrants. The practice of carving and decorating jack-o’-lanterns is an Irish custom that honored the souls stuck in purgatory. Legend has it that Stingy Jack roamed the Earth, unable to enter heaven or hell, with only a piece of burning coal in a carved out turnip to light his way. Since pumpkins are easier to carve than turnips, this ritual adapted into jack-o’-lanterns as All Hollow’s Eve celebrations took shape in America. Today, Halloween has grown into a nationally recognized festival. Over 179 million Americans plan to partake in festivities in 2017, according to the National Retail Federation. 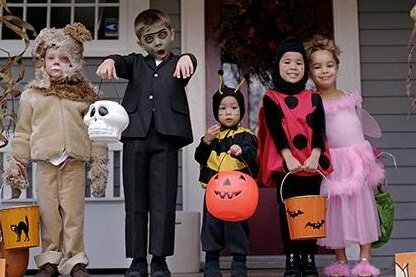 The top children’s costume is an action hero or superhero while adults are most likely to choose a witch. 10 percent of consumers will place their pets in a pumpkin costume.